The testimonials shown below are the latest feedback from our Thailand golf package tour guests. We highly value all feedback in order to further improve our services. First of all, thanks for our usual well organized golf week. Everything as planned, no surprises, well done. This may seem a little odd but we are already planning our golf week for next year. We will move from our usual location in Pattaya to Bangkok for the coming year. We are looking forward to receive your proposal. The driver was great and all arrangements went off without a hitch. Thanks, will certainly use your company again. Once again we could not fault our Thailand golf trip again this year, from the pick up at the airport, the golf courses, accommodation, and transfers, which make our stay much enjoyable and stress free. Unfortunately we shall not be returning next year as some of the boys can’t make it but will be there the following year for my 70th. Thank again for all of your help and will be in touch next year. Trip was well executed again by you and your staff and consequently Trevor and I had a great golfing holiday in Pattaya. Perhaps the only thing we would do differently would be the standard of play that some of the courses demanded. Being hackers, we are aware that we struggle with some difficult courses. Having said that, there is always room for at least one challenging 18 holes, perhaps towards the end of the holiday. So all and all an enjoyable time and although some of our golf was below par, the golf courses in Pattaya were spectacular and more than made up for our poor shots! The caddies were smiling and helpful and happy as far as we could ascertain. Well done Nic! Would consider you again next time. 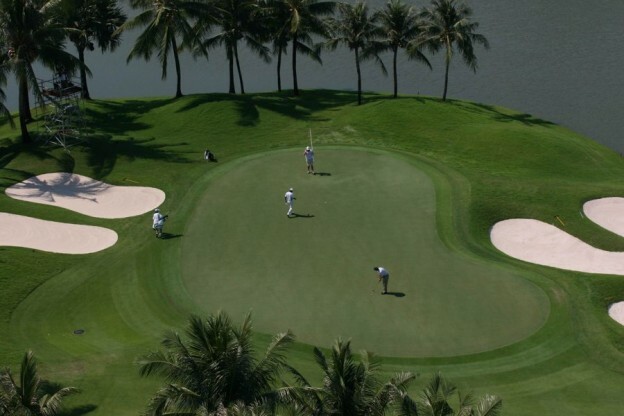 I found the Hua Hin golf tour well organised and will recommend you to others. My team has great time in Thailand and they like golf course in Hua Hin too. I will introduce to my friends about your company and also I will contact with you for next trip. I very much enjoyed the holiday. The transfers were very easy and the Amari hotel was also very good. I would happily stay there again. The golf was great I very much enjoyed the courses Black Mountain, Springfield and Banyan. We were very happy. I enjoy playing golf in Bangkok – even more when I get out early and get around the course quickly, as I did. Mr. Ton was very reliable with the transportation. When a family like ours takes a few days off to travel, the worst thing is having to worry about losing precious vacation time waiting for someone to transport you to or from your destinations. Reliability is the most important issue and I know I can rely upon your team to be on time. It’s why I continue to contact you when I do golf travel to Bangkok. I’m very happy with the service. We had as always a great time golfing in Hua Hin, the weather and the golf courses were perfect. We will hopefully go back next year will let you know in due time. We enjoyed golfing in Chiang Mai in January 2017 for a week. We intend to make golf tour in Hua Hin and Pattaya next year, maybe early Feb.
All was perfect during our golf tour in Bangkok! Please say hello to Khun Ton, he’s always been our driver and hopefully always will be. Just some feedback from our golf trip to Pattaya this last couple of weeks and would like to advise that everything ran like clockwork. Transfers and pickup were well planned and on time except for one late pickup but no worries, we just had another beer. Everyone enjoyed themselves as usual, not only the golf but our social time as well. I just wanted to take a moment to say thank you for a wonderful golf vacation in Thailand. The only thing I regret is I couldn’t stay longer. Thank you to you and your team for your assistance. Just wanted to say I was very happy with the Pattaya golf tour. Everything worked out great. I´ll make sure to recommend you and the next time I´m in Thailand I´ll book a tour from you again. I was tasked with arranging a Golf tour to Thailand for 12 mates from New Zealand. I had some ideas having been to Thailand previously, but quickly knew that I needed to enlist assistance from Thailand and came across Golf Tours Thailand on the internet. An enquiry was quickly responded to and from there a tour covering 8 days and 6 rounds of golf based in Pattaya and finally in Bangkok for the last round, was agreed. Golf Tours Thailand arranged all transport, hotels, golf. The quality of the Golf courses with carts and caddies was amazing and a real test for our group who are all keen golfers. Along the way I had many questions and all were promptly answered by the team at Golf Tours Thailand. The end result was an excellent tour which all of my party were glowing in their praise of the professional organization. I would not hesitate in recommending Golf Tours Thailand. Hi, just a quick note to thank you for your organization and arrangements. We had a great time and really enjoyed the courses and accommodation at Hua Hin. We are all back in Angeles, Philippines, and would like to thank you once again for a well organized, trouble free golfing trip. The accommodation was good quality and well positioned, the courses were typical of Thai golf courses and most enjoyable. There most likely will be a report on the trip on our club web site in a week or so, if you are interested. A quick note to let you know we all thought the holiday was a great success and thank you for your large part in it. We shall contact you again should we have another golf tour to Thailand.